Signalhorn provides premium network services and communications solutions with worldwide coverage using terrestrial, satellite and wireless technologies to provide continuous operations. The company delivers business-grade communications virtually everywhere on earth, with its advanced, worldwide satellite network. Regardless of the location, environment or infrastructure, mining and technology customers benefit from the same reliable, quality communications that they would expect to find in a corporate office. Signalhorn has more than 40 years of experience as a full service communications provider, and delivers communication services that customers need to locations they wouldn’t imagine possible. With the increasing global demand for minerals, mining companies are exploring ever more remote deposits around the world that are often far from landline communications networks. Many mining companies centralise their analytical and scientific functions at their headquarters, so have to transmit vast amounts of scientific, operational and financial data between their main offices and remote facilities. Signalhorn’s technology-agnostic, solution-centred approach meets customers’ requirements through integrating satellite, terrestrial and wireless networks, providing reliable and highly mobile communications between operation centres and remote locations, where staff are engaged in mining and other technology operations. Satellites play a critical role in ensuring that companies have access to high-quality, fixed and mobile communications worldwide, regardless of location. Mining companies and their contractors require reliable communications, not only for their own operations, but also as a vital lifeline for staff working in remote locations. Voice, video-conferencing, corporate networking and internet access all enable companies to address their daily business requirements, but also provide an important link for employees to connect with family and friends back home. The mining sector has traditionally depended on satellite communications to support its operations but this relationship is constantly being expanded and enhanced. New technologies, commercial models, regulatory approaches, training, corporate social responsibility (CSR) and other satellite communications-related advances are changing communication services. Signalhorn has $250m of terrestrial and teleport facilities and approximately 90 employees that design, manage and deliver complex, highly critical communications networks. The company continues to invest in equipment upgrades, specialised training classes, industry certifications and other critical assets to develop alongside the growing demands of the industry. Signalhorn’s highly trained employees work with more than 60 service partners in some 130 countries to provide customers with an understanding of the culture, business practices and local regulatory framework. 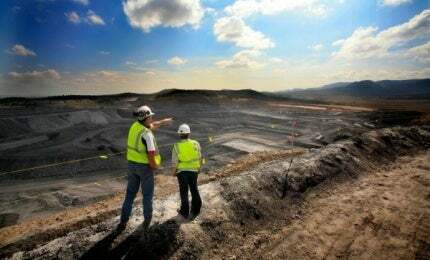 This in-country regulatory and licensing support enables mining customers to quickly navigate local regulations for rapid service deployment of secure and reliable communications networks. Signalhorn offers services and solutions that encompass end-to-end network design and management, including hosting and housing. Government and NGO customers all rely on the round-the-clock, responsive services and dependable solutions to support mission-critical operations. With proprietary technical centres in Switzerland and Germany, Signalhorn customers benefit from secure and cost-effective connectivity via dozens of satellites and hundreds of points of presence around the globe.